If you're looking for a boutique-style hostel, we think the multi-Hoscar-winning Living Lounge Hostel might be your place. Each of their light and airy rooms has been decorated in a different colourful theme by local artists. Hostelworld guests often note that the staff have proved to be accommodating to early morning arrivals and departures, organising special breakfasts and taxis. Also highly-praised is the hostel's nightly three-course dinner for only â'¬9, including wine. We particularly like that the free breakfast includes pancakes. It is a question that has always plagued the creative mind: does life reflect art or does art reflect life? Living Lounge, recently voted the second best medium hostel on Hostelworld, takes hostel art and travelling life to a whole new level. 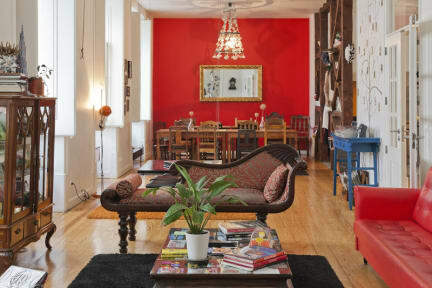 Each double, single and dorm room at the hostel is a unique work of art, having been individually designed by local artists to reflect different elements of Lisbon's rich culture. Although every room is different, theyve all been crafted with the same goal in mind: providing our guests with supreme comfort, security and style during their stay. We also have a budget room in the attic with narrow stairs and two individual beds. Our hostel features a luxurious and spacious downstairs lounge area, providing the perfect place to sip a drink, listen to music and meet people from around the world. Upstairs we have a peaceful indoor garden room, a lovely place to bring a book and relax. Our guests are welcome to use our free Wi-Fi internet, and our friendly staff can provide you with free maps and any tourist info you might need. Living Lounge is a project from the same group of Portuguese friends who own and operate the multi-award winning Lisbon Lounge Hostel. With Living Lounge, we bring you the same high standards of quality and design but with an exciting new artistic concept. Living Lounge is located in the heart of Lisbon's tourist centre, right on the border between the ritzy Chiado district and the historic Baixa. The Baixa-Chiado metro station is literally right across the street, and it is only a quick train ride to Lisbon's nearest beaches or a short stumble to Lisbon's best nightlife area - the Bairro Alto. We also provide a range of free activities, including nightlife tours and daytime walking tours. With piece-of-cake public transport access, you'll have no problem finding us. We look forward to providing you with an unforgettable stay in Lisbon. Important Note: From the 1st of January 2019, a city tax of 2€ per person per night will be charged on top of your bill and it must be paid on site. This tax is charged to guests aged 13 and older. It is subject to a maximum amount of 7 nights per guest. Can't fault this place. Staff were great, location is perfect and food that the chef cooked each night was really affordable and tasty. 10 euro for 3 course meal which included great company with a variety of nationalities staying in the hostel. Overall a perfect stay and I will return someday. It is so greattt! I booked three hostels during my trip this time. This is the best one. Highly recommend! 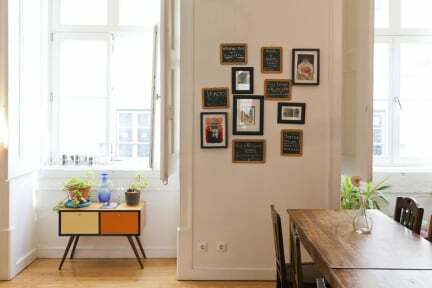 I chose this hostel because of the excellent location near the Baixa/Chiado metro station. Added bonuses were the creative décor, nicely renovated bathrooms, included breakfast, and friendly and helpful staff. They obviously know what they are doing, as everything ran smoothly and efficiently during my stay. People with large/heavy luggage should be aware that the hostel reception is up a few flights of stairs (2nd floor), which was okay for me, but could be difficult for some. This place was fabulous! The staff told us where the best places in the city where and boy were they right! Fado was amazing but what was even more incredible was dinner for 10 euros we had the best food possible accompanied by a great company... strangers from all over! 10/10 would do it again and next time stays longer this felt like a home away from home. Fab location. Comfortable hostel with super communal area. Lots of quirky features - most attractive. Crèpes at breakfast are vey good. Excellent location, nice hostel but they have very strong air freshener which I didn't like. Great Hostel for all ages. I think what makes this place special is a combination of our unique and inspired decoration, unbeatable central location, and passion for helping guests feel at home. All 23 of our rooms have been decorated by friends, local artists, DJs and designers, all trying to express the diversity of Lisbon's culture and history. We also offer quite a lot of extras, like daily free activities, nightly dinners, a free breakfast spread, free towels and free Internet access. It's a warm, welcoming home base and we're pretty confident that it helps our guests to fully enjoy all that this historic and vibrant city has to give. It's an easy stroll from here to the majority of the city's main attractions. You can visit the famous St. George's Castle, maze-like Alfama, water-front Praça do Comércio, and the bumping Bairro Alto night-life district without ever breaking a sweat. I usually tell guests that they should spend an afternoon or evening at one of the city's lookout points (miradouros), because it's sure to leave them with an impression more stunning than any guidebook can provide.